This is the so-called ‘aspirational’ and ‘non-binding’ agreement that Helen Clark’s Labour Government had considered too radical to support, but that John Key’s National Government signed. Given the importance of this announcement for the future, it’s worth reviewing the background in some detail. At 4.45 am New Zealand time on the 20th of April 2010, the Minister of Maori Affairs Dr Pita Sharples announced to the United Nations in New York that New Zealand would support UNDRIP. Later that day Prime Minister John Key announced to the New Zealand public – who had not been consulted – that the signing had taken place. It had been a clandestine affair – no-one had been told that Dr Sharples was flying to New York with officials and selected media to sign the agreement. Those involved had been sworn to secrecy. Supporting the Declaration was considered controversial because Helen Clark as Prime Minister had refused to sign on advice from Crown Law that it was fundamentally incompatible with New Zealand’s constitutional and legal arrangements. At the time, New Zealand was one of only four countries that hadn’t signed – the others were Australia, Canada, and the United States, which also had in place substantial legislative frameworks associated with early inhabitants. “It is therefore a matter of deep regret that we find ourselves unable to support the text before us today. In particular, four provisions in the Declaration are fundamentally incompatible with New Zealand’s constitutional and legal arrangements, the Treaty of Waitangi, and the principle of governing for the good of all our citizens. “These are Article 26 on lands and resources, Article 28 on redress, and Articles 19 and 32 on a right of veto over the State. “Madame President, the provision on lands and resources cannot be implemented in New Zealand. Article 26 states that indigenous peoples have a right to own, use, develop or control lands and territories that they have traditionally owned, occupied or used. For New Zealand, the entire country is potentially caught within the scope of the Article. The Article appears to require recognition of rights to lands now lawfully owned by other citizens, both indigenous and non-indigenous, and does not take into account the customs, traditions, and land tenure systems of the indigenous peoples concerned. Furthermore, this Article implies that indigenous peoples have rights that others do not have. “In addition, the provisions on redress and compensation, in particular in Article 28, are unworkable in New Zealand, despite the unparalleled and extensive processes that exist under New Zealand law in this regard. Again, the entire country would appear to fall within the scope of the Article and the text generally takes no account of the fact that land may now be occupied or owned legitimately by others or subject to numerous different, or overlapping, indigenous claims. It is impossible for the State in New Zealand to uphold a right to redress and provide compensation for value for the entire country – and indeed financial compensation has generally not been the principal objective of most indigenous groups seeking settlements in New Zealand. 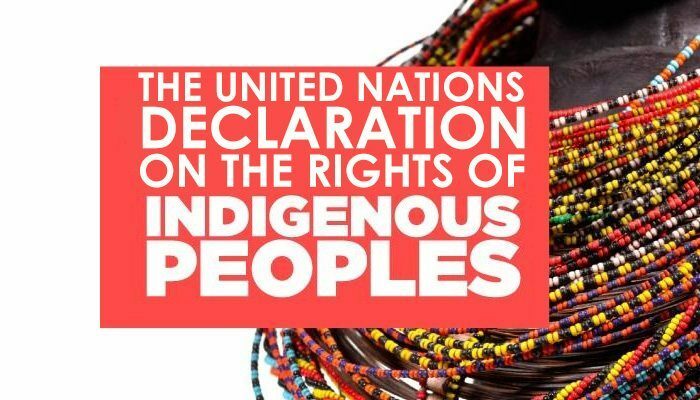 “Finally, the Declaration implies that indigenous peoples have a right of veto over a democratic legislature and national resource management, in particular Articles 19 and 32(2). We strongly support the full and active engagement of indigenous peoples in democratic decision-making processes. We also have some of the most extensive consultation mechanisms in the world, where the principles of the Treaty of Waitangi, including the principle of informed consent, are enshrined in resource management law. But these Articles imply different classes of citizenship, where indigenous have a right of veto that other groups or individuals do not have. “Unfortunately, these are not the only provisions that cause us difficulties; for example, we also have concerns about Article 31 concerning intellectual property. “Madame President, New Zealand takes international human rights and our international human rights obligations seriously. But we are unable to support a text that includes provisions that are so fundamentally incompatible with our democratic processes, our legislation and our constitutional arrangements. These provisions are all discriminatory in the New Zealand context. 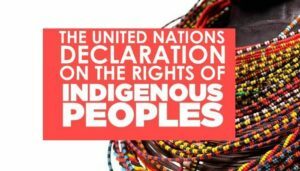 Altogether UNDRIP – see HERE – consists of 46 Articles which confer special rights on indigenous people that elevate their status above that of all other citizens. These include the right to “self-determination” and separate self-rule, through their own political, economic, legal, social and cultural systems. It includes separate education, health and housing (all funded by the state), the right to virtually all of New Zealand’s land and resources, the right to on-going compensation, and the right of veto over the actions of the Government. The whole Declaration is at such great odds with the concept of New Zealand as a modern democratic nation where people of all races are equal before the law, that it’s almost impossible to understand how John Key and his National Government could have justified even contemplating signing. At the time the PM said the Declaration was a symbolic aspirational affirmation of indigeneity. The warning that UNDRIP was it is in fact a lever to set in motion an agenda which would see the tribal elite assuming higher authority over domestic matters than other New Zealanders, was ignored. He outlined what he believed was a crucial safeguard: “The statement in support of the Declaration, reaffirms the legal and constitutional frameworks that underpin New Zealand’s legal system, noting that those existing frameworks define the bounds of New Zealand’s engagement with the declaration”. Now, in announcing they will implement UNDRIP, it is Winston Peters’ Government that intends taking that “final step on the road to separatism”. According to a Cabinet minute, on 5 March 2019 Government Ministers – including Winston Peters – agreed that the Minister of Maori Development would develop a national plan of action for the implementation of the Declaration. A technical working group will be established and “an engagement process with iwi, hapū and whānau that embodies New Zealand’s best practice under Te Tiriti o Waitangi and the Declaration” will be developed. The Minister is expected to report back her plan by August. So there you have it. Thanks to his approval, the final step to separatism that Winston Peters warned about is now underway. Public concerns about the Declaration, that National dismissed as scaremongering, are now coming to fruition. By allowing themselves to be manipulated by the Maori Party into introducing a powerful weapon for Maori supremacy, National set the scene for its implementation. “Canada has always been solidly with The United States, Australia and New Zealand In refusing to acknowledge UNDRIP as anything more than an aspirational document. But now it seems that the current government has thrown all caution to the wind, and intends to force UNDRIP through Parliament as Canadian law. Bill C-262 has received third reading in the Commons and first reading in the Senate. Unless wiser heads in the Senate can stop this juggernaut we may soon be saddled with a monster that will destroy jobs, compromise Canada’s economic future, and negatively affect the governance of the country. Heaven help us if Winston Peters and his Government decide to do the same thing!